Bobby Allison. Custom Made with Revell 1:24 Die-cast. Winston Cup Series. #12 Miller High Life. '88 Buick Regal. Custom Made To The Best Of Our Ability. Use zoom, if it bothers you then don't buy. If you have made it this far. New in Box, This is a Action 1982 Cale Yarborough #27 Valvoline Buick Regal Limited Edition (1 of 973) diecast collectible car 1/24th scale. Hood opens. THIS IS THE SKOAL BANDIT BUICK DRIVEN BY HARRY GANT AND OWNED BY BURT REYNOLDS AND HAL NEEDHAM IN 1982. This is a beautiful custom built 1/24 scale car. It started out as a buick race car, from Racing Champions. New, Never removed from display case, tape has never been punctured. There is no need to request one we do it automatically. Do you have any more pictures available you can send?. IN AN ENCLOSED GLASS. DISPLAY CASE. Action put these out in 1995 with a production run of. lease view pictures for actual quality. As always there is no reserve on this item. Keep in mind that when I talk about the condition of the boxes, sleeves or the car that we do not believe that there is a flawless car out there. Darrell Waltrip. 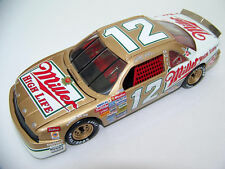 Driver: Darrell Waltrip #11. Very Rare Limited Edition Diecast Bank. Year: 1995. Production Run: 1 of only 5,000. Cale Yarborough 1/24 2015 Release ACTION 1982 #27 VALVOLINE BUICK REGAL NASCAR CLASSICS. Condition is New, still wrapped in the original paper. Will be shipped USPS Priority Mail. 1/24 Action Lionel Nascar Classics #2 JD Stacy 1982 Buick Regal as driven by the Late Tim Richmond. Features opening hood and full engine chassis and interior detail highlight this accurate replica of the car that got Tim his first top 5 Finish.